The 20" model had the following dimensions and weight: 18.6" H x 19.4" W x 7.4" D, 25.2 lbs. 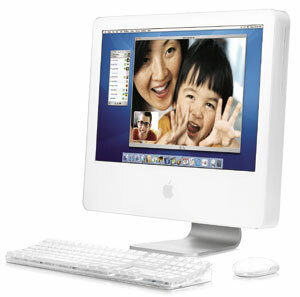 Introduced on the last day of August 2004, the iMac G5 brought G5 muscle to Apple's consumer desktop line. Housed in a completely new enclosure reminiscent of Apple's Cinema Display line, the iMac G5 was a marvel of miniaturization. The case was only two inches thick, yet housed a machine considerably faster and more advanced than its G4-based predecessor. 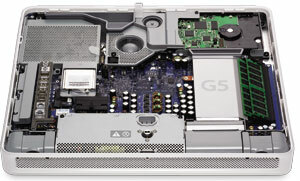 In addition to a 64-bit G5 processor, the iMac G5 also included a much faster memory bus, better graphics for the low-end model, twice the hard drive space for the high-end model, and a new audio port which doubled as an optical digital audio output. The iMac G5 was initially available in three configurations: 17" LCD/1.6 GHz/80 GB hard drive/256 MB of RAM/Combo drive/$1299, 17" LCD/1.8 GHz/80 GB hard drive/256 MB of RAM/SuperDrive/$1499, and 20" LCD/1.8 GHz/160 GB hard drive/256 MB of RAM/SuperDrive/$1899.